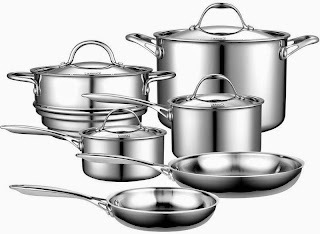 How come "stainless steel" kitchen pans and kettles rust? Home » Stainless steel kitchenware » How come "stainless steel" kitchen pans and kettles rust? I thought stainless steel isn't supposed to rust. Most recently, I discovered the inside of my "stainlesss steel" KitchenAid kettle, was rusting. This doesn't make any sense. So does this mean that the manufacturer is lying about the metal composition of the kettle? If so, what are my options? The warranty was up many years ago. Isn't the consumption of rust, which is inevitable if you are using cookware that has rust on it, a health hazard? I've noticed that many "stainless steel" cookware items tend to rust after a while. I know when I was growing up, stainless steel meant no rusting. What has happened in the last decade to our cooking ware? And what are the health consequences of consuming rust in our foods?